In this article, we will learn how to deploy an ASP.NET Core hosted Blazor application on Azure. In this article, we will learn how to deploy an ASP.NET Core hosted Blazor application on Azure. We will use Visual Studio 2017 to publish the app and create an SQL database server on Azure to handle the DB operations. We will create a resource group on the Azure portal to contain all our resources on Azure. 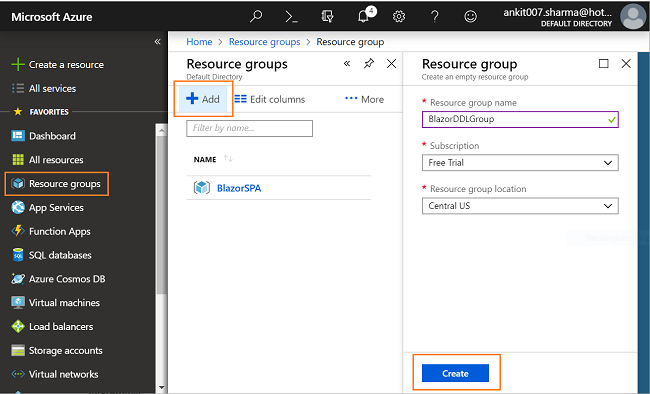 Log into the Azure portal and click on “Resource groups” on the left menu and then click Add. It will open a “Resource group” window, as shown in the image below. Resource group name: Give a unique name to your resource group. Here, we will use the name BlazorDDLGroup. Subscription: Select your subscription type from the drop-down. Here, we are selecting the “free trial” subscription. 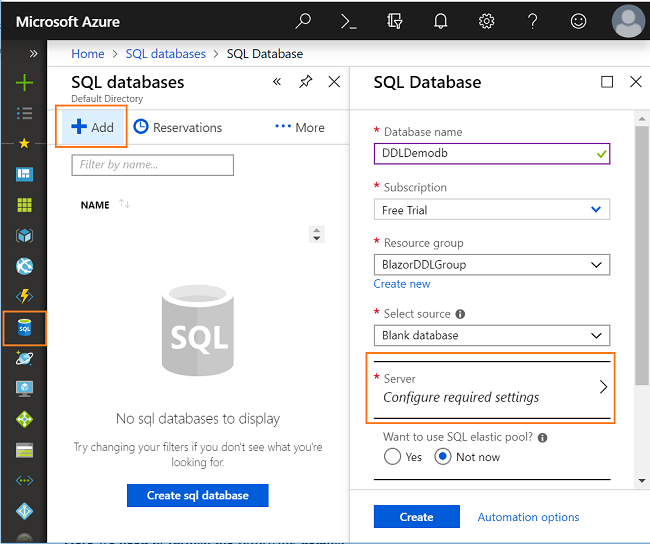 Click on “SQL databases” on the left menu of your Azure portal and then click Add. It will open an “SQL Database” window, as shown in the image below. Subscription: Select your subscription type from the drop-down. Here we are selecting the “free trial” subscription. Select source: This drop-down contains a list of databases with predefined data provided by Azure. Since we are creating our custom database, hence we will select “Blank database” from this drop-down. Before creating the database, we need to create a database server for the SQL database. Click on the “Server configure required settings” and then click “Create a new server”. It will open a “New server” window, as shown in the image below. Server name: Provide a name for your DB server. Here, we will use ddldemoserver. The DB server will be created by appending “.database.windows.net” to the user provided server name. Hence, the server name will be “ddldbserver.database.windows.net” in this case. 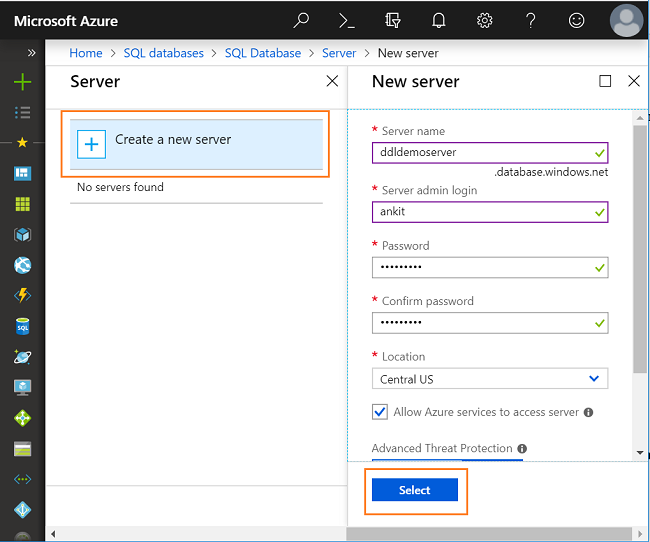 Check the “Allow Azure services to access server” checkbox and click on “Select” to create your DB Server. The word “admin” is restricted for the administrator username of the database server. Use any other username than “admin”. Once the DB server gets created, you will be redirected to the “SQL Database” window. You need to click on the “Create” button to create your database. The database DDLDemodb do not contain the tables that we are using in our application. 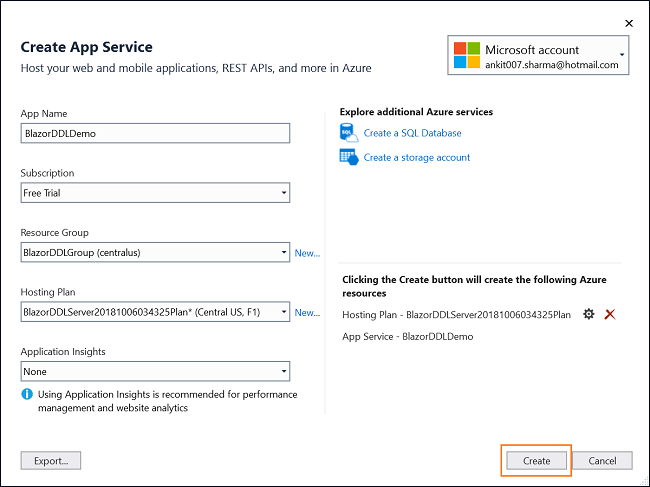 We will connect to the Azure database using SQL Server Management Studio (SSMS) to create our DB objects. Open SSMS in your machine and put the server name as “ddldbserver.database.windows.net”. Provide the admin user id and password that you have configured in the previous section and click on “Connect”. Once the connection is successful, you can see the DDLDemodb database on the server. Refer to the article Cascading DropDownList in Blazor Using EF Core and run the SQL commands to create and insert sample data in the Country and Cities table that we are using in our application. 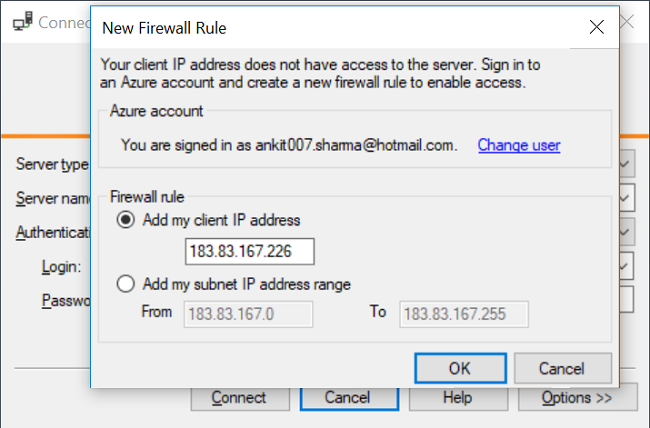 You need to put the admin user id and password for the database server that you have configured earlier in this connection string. Open BlazorDDL application using Visual Studio, navigate to BlazorDDL.Shared/Models/myTestDBContext.cs and replace the local connection string with this new connection string. The fields of this window are prepopulated as per the configuration of your Azure account. However, you can change these values as per your requirement. App Name: Provide an app name for your application. The app name is subject to availability. If the app name you provided is already in use then you need to give a new app name. The website’s public URL will be App Name followed by ".azurewebsites.net". Here we are using the name as BlazorDDLDemo, hence the URL for our website will be "BlazorDDLDemo.azurewebsites.net". 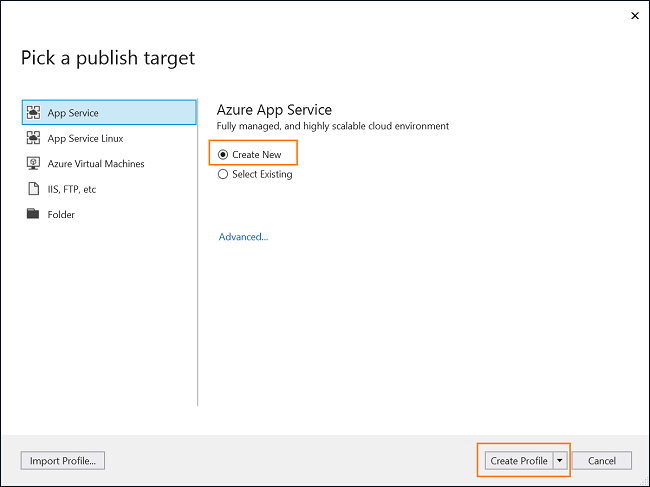 Click on the “Create” button to start the application deployment on Azure. It will take a few minutes to complete depending on your internet connection speed. 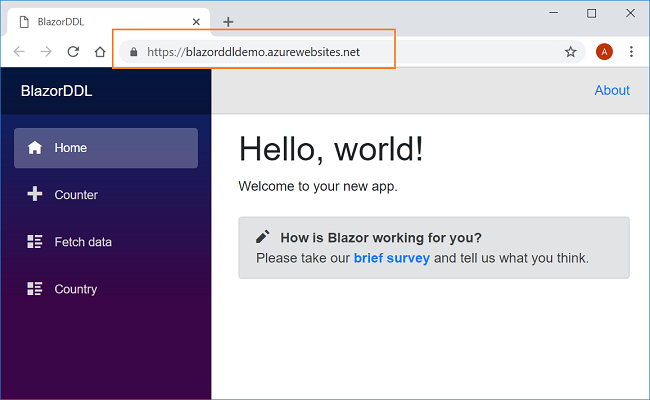 In this article, we learned how to deploy and publish a Blazor application on Azure. We created a SQL database and DB server on Azure and used it in our application to handle the DB operations.